Western sophomore Summer Brown poses with her IHSAA state swim finals medals. INDIANAPOLIS – Western sophomore Summer Brown was the lone Howard County representative at the IHSAA Girls Swimming and Diving State Championships, and she didn’t disappoint. One week after pulling an upset to win the 200 yard freestyle sectional crown, Brown broke two school records and took home a pair of podium finishes. Brown started the weekend as the 15th seed in the 100 yard freestyle, but in the preliminary round on Friday night at the IUPUI Natatorium, she broke Kait Flederbach’s school-record with a time of 51.50, and in the process she earned a spot in Saturday’s championship race of eight swimmers. In the 200 preliminary, she broke her own school record time of 1:50.88 to punch her ticket into the championship heat of that event – meaning she was guaranteed two top eight finishes the following day. “It was a goal of mine to beat the records and I am happy I could accomplish it,” said Brown, who earned a pair of 13th place finishes last year as a freshman. Following her record-breaking preliminary round, she returned on Championship Saturday and swam to a pair of medals. 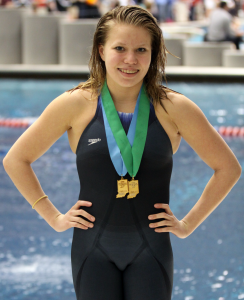 She placed fifth in the 200 (1:51.69) and seventh in the 100 (52.28) in the largest Natatorium in the United States. Western coach Brad Bennett was as excited as Brown was after she climbed of the podium for the second time. He noted that his biggest surprise was her school-record swim in the 100. The Brown family is no stranger to the pool or earning medals at the IHSAA state meet. Her father swam at Princeton and her older brother, Ted, was an All-American two-time state champion swimmer for the Panthers in 2003, capturing the 200 yard IM and 500 yard freestyle. He also was a team captain at Notre Dame and a six-time All-Big East honoree. Summer said his presence at meets and his encouragement helps make her a stronger swimmer. And if the super sophomore continues to improve and get stronger, she might just climb on that top step to become the second member of the Brown family to receive an Indiana state championship swimming medal. This entry was posted in High School, IHSAA, Summer Brown, Swimming and Diving, Western. Bookmark the permalink.